Composed by Theodore Morse. Dwellings, Portraits, Silhouettes, Trees, African Americans, Ethnic stereotypes, Musicians. Lester S. Levy Collection. 5 pages. Published by Johns Hopkins University Sheridan Libraries (LV.8823). 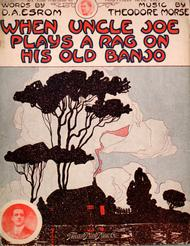 When Uncle Joe Plays a Rag on His Old Banjo. Words by D.A. ESrom. Music by Theodore Morse. Published 1912 by Theodore Morse Music Co., 1367-9 Broadway in New York. Composition of strophic with chorus with piano and voice instrumentation. Subject headings for this piece include Dwellings, Portraits, Silhouettes, Trees, African Americans, Ethnic stereotypes, Musicians. First line reads "Down in Dixie lives old Uncle Joe. ".